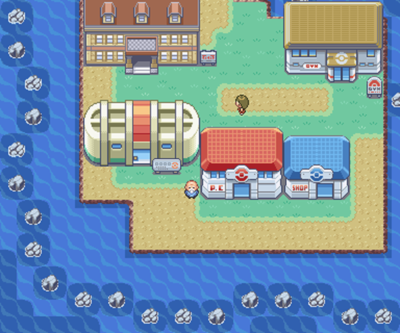 Cinnabar Island is an island located in the southwestern part of the Kanto region. 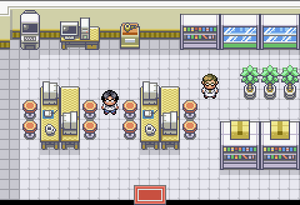 It is home to the famous Pokémon Lab, said to be able to resurrect Pokemon from the ancient past. Don't forget to trade the fossil and the Old Amber for a couple of Pokémon, otherwise unobtainable. 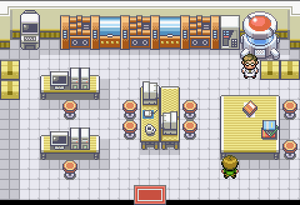 The Pokémon Lab is a laboratory founded by Dr. Fuji. The only real reason to visit here, is to make a few trades. You will also get a chance to trade the Fossil you chose at Mt. Moon and the Old Amber from the Science Museum at Pewter City, for a couple of Pokémon otherwise unobtainable. 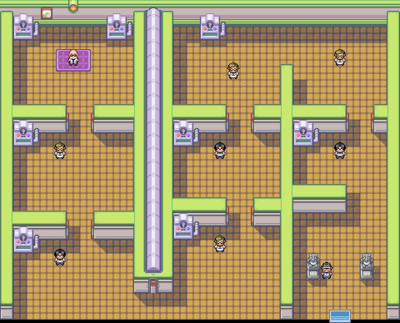 In the first room of the Pokémon Lab, there are two people who will offer to trade Pokémon. The old man will offer his Electrode for a Raichu, and the girl will want to trade her Tangela for a Venonat. Stardust (held by Tangeny, the Tangela you can obtain in the trade). 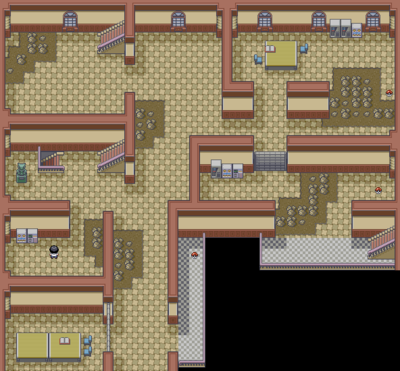 In the second room, there is a Move Tutor on the left who will teach Metronome to one of your Pokémon. Metronome randomly selects a move and fully executes the attack, including moves affected by Disable. In the third room, there is a weird doctor who will revive the fossils you obtained at Mt. Moon and the museum in Pewter City, however you must walk out of the building before returning to claim the fossil Pokémon. You may have some trouble leveling them up, as they're all revived at level 5. There is also another in-game trade: Ponyta for Seel, just talk to the blond guy in green. 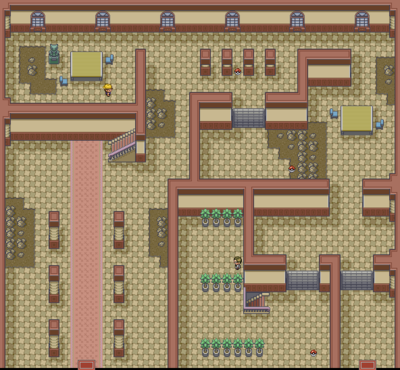 Find the Secret Key to unlock the Cinnabar Gym door and fight Blaine for a shot at the Volcano Badge. The Pokémon Mansion is a decrepit, burned-down mansion. It got its name because a famous Pokémon Researcher once lived there. Amongst the rubble and wreckage is information that the scientists who once worked there obtained a Mew and impregnated it with the genetically altered Mewtwo, who destroyed the Mansion in its escape. 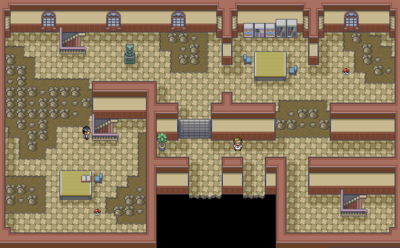 To access the Cinnabar Gym, you have to enter the mansion and find the Secret Key to unlock the door of the Gym. The Pokémon Mansion has four different floors. Doors can be unlocked in the mansion by pressing switches hidden in Pokémon statues. Unless you want to get the items, there's nothing to do here. Proceed to the second floor from the stairs at the end of the main hall. There can be lots of walking pokemon, so consider using super repellant or the cleanse tag. Turn off the switch in the room where you entered, to open the northwest room sliding door and go up the stairs to the third floor. Turn the switch in front of the stairs where you entered on and go to the hallway in the middle of the floor. Drop from the pit on the left (the widest one), you will fall on the previously inaccessible southeast area of the first floor. Go down the stairway to the basement. What does a man with power want? Don't forget to grab TM22 Solar Beam and TM14 Blizzard, these are two very powerful Grass and Ice moves, respectively. Proceed to the south center room and turn the switch off, exit from the west side and enter the north area from the east door, which now will be open. 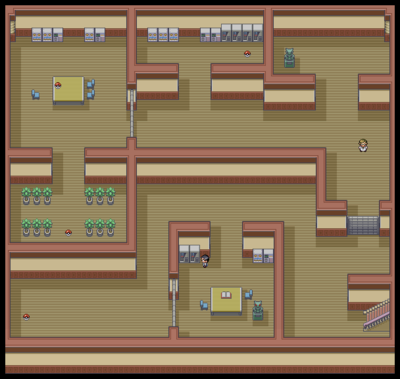 Turn the switch on the northeastern room and then go to the northwestern room to get the Secret Key from the desk, you'll finally be able to open the Cinnabar Gym. Fans of the show will probably recognize this Pokemon. Koffing is a pure Poison Pokemon with a very high defense and decent attack stats. Koffing's moveset appears to be focused upon Self-Sacrifice for the better good. This moveset includes Selfdestruct and Explosion, moves which will make the user faint, but will inflict massive damage onto the opponent. In addition, Destiny Bond and Memento also entail fainting to take down the opponent, or severely weaken it. Including Koffing in your team so you can make it do kamikaze attacks is certainly feasible, but most players will probably seek different strategies to defeat the Elite Four. Koffing evolves into Weezing at Level 35. Another pure Poison Pokemon, Grimer is a Pokemon clearly shaped as a "tank", to stall and delay opponents. A player seeking to use Grimer in battle will probably take advantage of its defensive moves such as Minimize and Acid Armor, to deflect and endure the attacks of the opponent, while attacking with Sludge or Sludge Bomb and letting the poison status ailment take the opponent down. Despite Grimer's strong HP and defensive stats, there are other Poison Pokemon that are much more versatile and appropriate to the "tank" role. Thus, Grimer is best left behind in your PC instead. Grimer will evolve into Muk at Level 38. A Pokemon exclusive to Fire Red, Shellder's defenses are off the scale, and also brings not too shabby attack and Spc. Atk stats to the table. Shellder's moveset is mostly focused on Ice attacks such as Icicle Spear and Aurora Beam, but can also learn Surf and Waterfall through HM's. Once evolved into Cloyster through a Water Stone, this Pokemon will become a great choice for your Water/Ice spot in your team, competing with Lapras or Vaporeon. A Pokemon exclusive to Leaf Green, Staryu, has decent stats across the board, and a great moveset. Staryu's moves are very varied, including Recover, Light Screen and Bubblebeam. In addition, when evolved to Starmie by a Water Stone, it gains the Psychic type as well, allowing it to take full advantage of strong TM's and HM's such as Psychic and Surf. Starmie makes a good sweeper and a great choice for the Water spot in your team, but remember to capture a Staryu that carries the Natural Cure ability, to allow it to cure itself of any status ailments. Kabuto, one of the Fossil Pokemon you can choose at Mt. Moon, is a Rock/Water Pokemon that possesses great attack and defense stats. Kabuto's moveset is somewhat better than its counterpart, including moves such as Mega Drain and Ancient Power. Unfortunately, Kabuto's special stats are somewhat low, a major weakness for a Water Pokemon, and given that you receive it so late and at a pitiful Level 5, it just is not worth adding to your team. Kabuto evolves into Kabutops at Level 40. Omanyte, the other Fossil Pokemon you can choose at Mt. Moon, is a Rock/Water Pokemon with excellent Spc. Atk and defense stats. Omanyte lacks a good moveset, but can unlock great potential if it is obtained with the Swift Swim ability and then taught Rain Dance by TM. This combo exponentially increases its speed, and combined with other choice TM's and HM's such as Surf, it can become a worthwhile Water Pokemon for your team. Unfortunately, you'll obtain Omanyte at Level 5, and for many players it may not be worth raising it when other Water Pokemon are available much earlier and with similar stats. Omanyte evolves into Omastar at Level 40. Aerodactyl, the Fossil Pokemon, is arguably one of the best Flying Pokemon in the game. Sporting Rock/Flying types, strong Attack and Speed stats, and a good moveset, Aerodactyl is an excellent choice for any team. Aerodactyl will learn great moves such as Ancient Power and Wing Attack that will benefit from STAB, and can be taught a variety of TM's as well. Unfortunately, Aerodactyl is obtained very late in the game, and at a measly Level 5, it becomes quite a hassle to raise it to a respectable level. If you do choose to add Aerodactyl to your team, it is heavily recommended that you obtain it with the Rock Head ability, as it allows it to combo with Double-Edge, a taught move that will help Aerodactyl decimate most opponents in one shot. The Cinnabar Gym is the official gym of Cinnabar Island. It specializes on Fire-type Pokémon. The Gym Leader is Blaine. If you defeat him, you'll receive the Volcano Badge. "Pokémon Quiz! Get it right and the door opens to the next room! Get it wrong and face a trainer! If you want to conserve your Pokémon for the Gym Leader... Then get it right! Here we go! Caterpie evolves into Metapod?" Yes, Caterpie evolves into Metapod, then into Butterfree. "There are 9 certified Pokémon League Badges?" No, there are only 8. No, he evolves only twice; first into Poliwhirl, then into Poliwrath. "Are thunder moves effective against ground element-type Pokémon?" "Pokémon of the same kind and level are not identical?" Even if you answer the question right, you still have the option to challenge the Trainer. Now that you've acquired the Volcano Badge, Bill (of PC fame) will meet you outside the gym. He mentions that he's going to one of the Sevii Islands and wants you to come along. 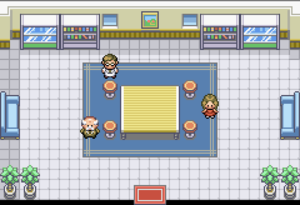 You'll most likely need to heal after the battle with Blaine, and you still have not tackled Route 21, just say "NO" and Bill will wait at the Pokemon Center for you when you're ready. Finish up Route 21, and then make sure that you're well stocked on Ultra Balls, Moltres is ahead! But before you can get your hands on the Legendary Bird, there will be a few side quests for you to finish at the Sevii Islands. This page was last edited on 14 July 2017, at 05:49. This page has been accessed 1,384,498 times.